DIE Martis, videlicet, 17 Maii. Lords sent to the L. Keeper, to know if the Term was to be removed to York. Message to the H. C. to acquaint them that Justice Berkeley's Trial is deferred. L. Morley and Mr. Kirke, about the Murder of Captain Clarke. 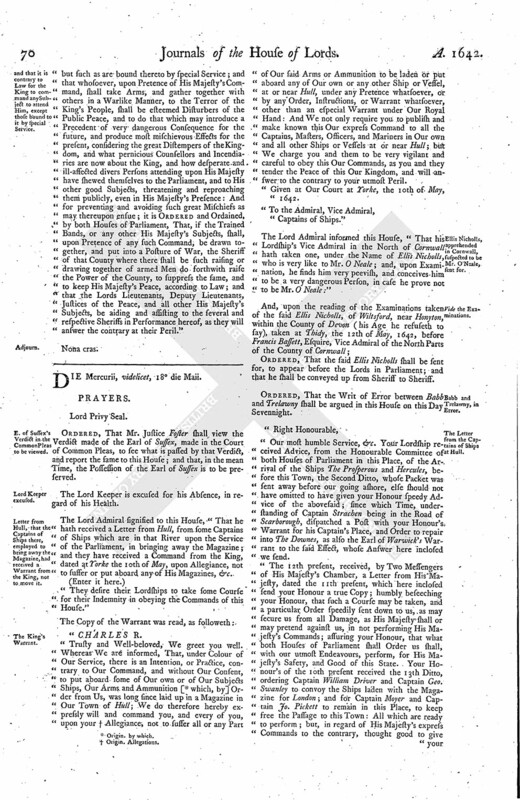 L. Keeper directed by the King to issue a Proclamation and Writs, for removing the next Term to York. Resolutions of the House upon it. Message from thence, for a Conference about a Letter from the King to Skippon. Order to prevent the Term being removed to York. Message to the French Ambassador, to preserve good Correspondency between the Two Kingdoms. L. St. John and Benyon. Conference about the King's Letter to Serjeant Major General Skippon reported. 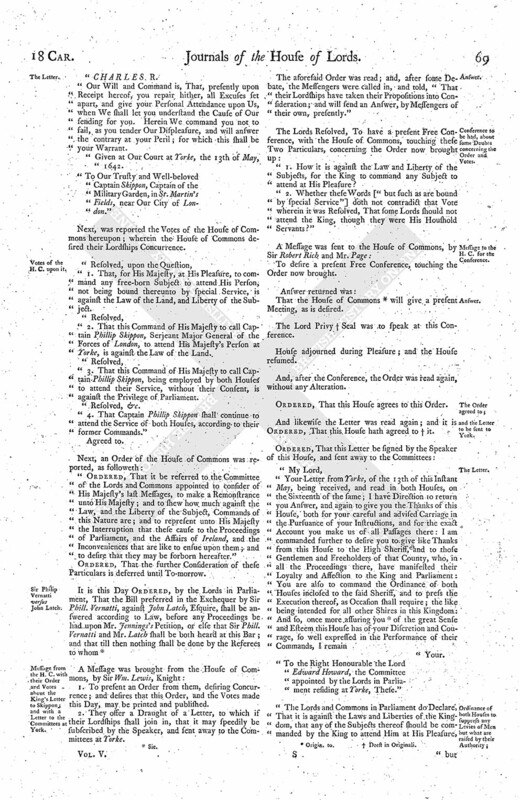 Votes of the H.C. upon it. Sir Philip Vernatti versus John Latch. Message from the H.C. with their Order and Votes about the King's Letter to Skippon; and with a Letter to the Committees at York. Conference to be had, about some Doubts concerning the Order and Votes. Message to the H. C. for the Conference. and the Letter to be sent to York. and that it is contrary to Law for the King to command any Subject to attend Him, except those bound to it by special Service. The House was informed, "That there was a Rumour that there was a Command come, for the removing of the next Term to Yorke;" which would be so prejudicial to this Kingdom, the Earl of Essex and the Lord Kymbolton were appointed to go to the Lord Keeper, to know if he hears any Certainty thereof. Ordered, That, in regard of the pressing Occasions of the Kingdom, the Trial of Justice Berkley shall be put off until Saturday next, if the House of Commons can then be ready. A Message was sent to the House of Commons, by Sir Robert Rich and Mr. Page, to acquaint them herewith. "That the Lord Morley and Mr. Kerke were indicted for the Murder of Captain Clarke. "28 January 1641, the Order of this House to try the Lord Morley here, and Mr. Kerke the next Day. "That, by another Order of this House, the Lord Morley is to be tried on Saturday next. 'That there have been some Endeavours to cast the Fact upon the Lord Morlies. "They are both in One Indictment; and, if Captain Kerke be found guilty, it (fn. 2) will disadvantage the Lord Morley." Mr. Chute, for Captain Kerke, said, "That there is no Rule in Law, nor Privilege, why he should not be tried. "The Indictment is already found; and he is desirous to come to his Trial, and not to lie under so great a Charge." 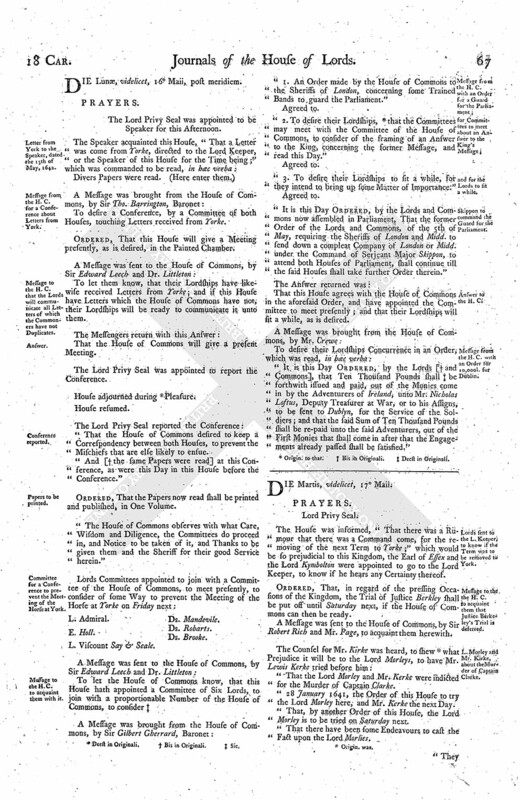 Ordered, That all Restraint shall be taken off, from debarring Mr. Kirke from his Trial at Law, concerning the Death of Captain Clarke; and that the Indictment transmitted in this House shall be returned into the King's Bench, that Captain Kirke may be tried there according to the Course of the Law; and the Lord Morlies Trial to be, as it is already settled to be, by Impeachment from the House of Commons, by the prosecution of the Widow. The Earl of Essex and the Lord Kymbolton reported, That they have been with the Lord Keeper, from this House, to know of him whether he hath heard any Thing concerning the adjourning of the next Term to Yorke; and his Lordship confesses he received a Letter from the King last Night, to signify the King's Pleasure to have the next Term adjourned to Yorke, and that for this Purpose a Proclamation and Writs should be issued forth; and that his Lordship was to advise with the Judges concerning the Manner of them, which accordingly his Lordship hath acquainted the Judges with it, and nobody else; but nothing yet is done therein." 1. And was of Opinion, That it is illegal to remove the Term, in regard of the late Act of Parliament for the Continuance of it. 2. Contrary to the Practice of Parliament, and inconsistent to the Sitting of Parliament, and the Act of Parliament lately passed for Continuance of the Parliament. 3. Contrary to the express Writ that calls Assistants to this House. "Whether the King's removing of the Term to Yorke from Westm. sitting this Parliament, is illegal or not?" This Vote is to be delivered to the Lord Keeper, with an Order from this House. To desire a Conference, by a Committee of both Houses, touching the adjourning of the next Term to Yorke. To desire a Conference, touching a Letter from the King, written to Serjeant Major Skippon, which concerns the Privilege of the Parliament. That their Lordships will give a Meeting accordingly. The Earl of Cambridge desired Leave of this House to go to Yorke, which this House gave him Leave to go. "Whereas the Lords in Parliament have this Day been informed, That the King resolved to adjourn the next Term from Westm. to Yorke; upon which the Lords sent a Committee to the Lord Keeper of the Great Seal of England, to know of him, whether he had received any Command touching [ (fn. 3) the same]; who acquainted the said Committee, that he had received Command from His Majesty to issue Proclamations and Writs to that Purpose: Whereupon this House, taking the said Matter into Consideration, hath voted, That the King's Removal of the Term to Yorke from Westm. sitting this Parliament, is illegal; and hath further Ordered, That the said Lord Keeper shall not issue out any Writs, or seal any Proclamation, for adjourning the said next Term from Westm. to Yorke, as aforesaid." Ordered, That the Vote this Morning, and this Order, shall be forthwith printed and published. This House appointed, that this Order, and the Vote, shall be communicated to the House of Commons at the Conference; and the Earl of Essex is to make a Narrative of what hath passed in this Matter this Morning. It is this Day Ordered, by the Lords in Parliament, That the Earl of Holland and the (fn. 3) Lord Mandevile shall go to the Ambassador of France, and signify unto him from the Lords in Parliament, That they know of no such Instructions given to Sir Tho, Rowe as was mentioned in the Extract of the Letter delivered to them by the Earl of Holland; and that they shall be careful by all Means to prevent all Misunderstandings, and to preserve a constant Amity, betwixt the Two Crowns of France and England." Upon the reading of the Petition of George Benyon; it is Ordered, That the Lord St. Johns shall see this Petition; and if any just Exceptions can be made against any Witnesses, this House (fn. 4) will consider of it at the Hearing. Ordered, That the whole Cause between the Town of Colchester and Freshfeild is referred wholly to the Lord Keeper. It is Ordered, That the Auditor in the Lord St. John's Cause shall go forward with the Examinations of Witnesses; and that no Exceptions shall be made against them until the Cause come to be heard at this Bar. Ordered, That the Cause of the Lord St. Johns against George Benyon shall be put off until Tuesday next; and that the Servants who are intrusted by Mr. Auditor Hill with his Books and Records are hereby Ordered to let the Lord St. John's Counsel, or Solicitor, have the Perusal and Copies of the Declaration of the Accompts of George Benyon, together with the Times that Mr. Benyon doth by those Accompts make himself Debtor to the King. "1. That he had communicated the Vote made this Morning, and the Order made to the Lord Keeper. Our Will and Command is, That, presently upon Receipt hereof, you repair hither, all Excuses set apart, and give your Personal Attendance upon Us, when We shall let you understand the Cause of Our sending for you. Herein We command you not to fail, as you tender Our Displeasure, and will answer the contrary at your Peril; for which this shall be your Warrant. Given at Our Court at Yorke, the 13th of May, 1642. "To Our Trusty and Well-beloved Captain Skippon, Captain of the Military Garden, in St. Martin's Fields, near Our City of London." Next, was reported the Votes of the House of Commons hereupon; wherein the House of Commons desired their Lordships Concurrence. "1. That, for His Majesty, at His Pleasure, to command any free-born Subject to attend His Person, not being bound thereunto by special Service, is against the Law of the Land, and Liberty of the Subject. "2. That this Command of His Majesty to call Captain Phillip Skippon, Serjeant Major General of the Forces of London, to attend His Majesty's Person at Yorke, is against the Law of the Land. "3. That this Command of His Majesty to call Captain Phillip Skippon, being employed by both Houses to attend their Service, without their Consent, is against the Privilege of Parliament. "4. That Captain Phillip Skippon shall continue to attend the Service of both Houses, according to their former Commands." 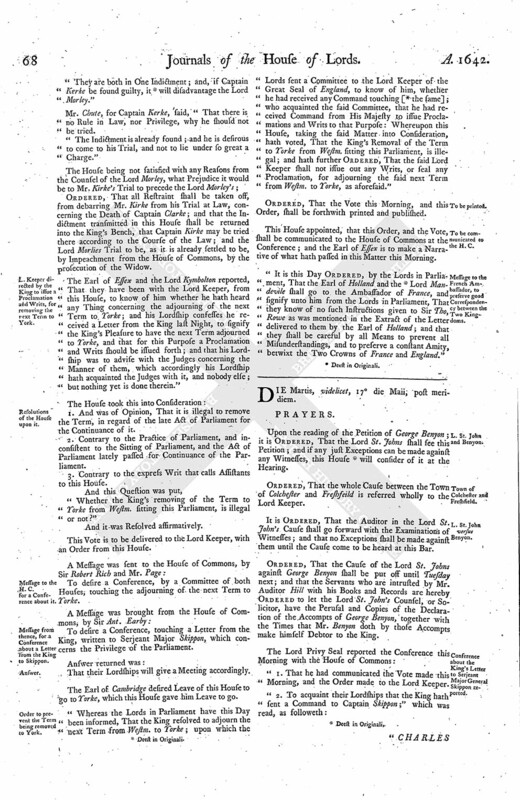 "Ordered, That it be referred to the Committee of the Lords and Commons appointed to consider of His Majesty's last Messages, to make a Remonstrance unto His Majesty; and to shew how much against the Law, and the Liberty of the Subject, Commands of this Nature are; and to represent unto His Majesty the Interruption that these cause to the Proceedings of Parliament, and the Affairs of Ireland, and the Inconveniences that are like to ensue upon them; and to desire that they may be forborn hereafter." Ordered, That the further Consideration of these Particulars is deferred until To-morrow. 1. To present an Order from them, desiring Concurrence; and desires that this Order, and the Votes made this Day, may be printed and published. 2. They offer a Draught of a Letter, to which if their Lordships shall join in, that it may speedily be subscribed by the Speaker, and sent away to the Committees at Yorke. The aforesaid Order was read; and, after some Debate, the Messengers were called in, and told, "That their Lordships have taken their Propositions into Consideration; and will send an Answer, by Messengers of their own, presently." "1. How it is against the Law and Liberty of the Subjects, for the King to command any Subject to attend at His Pleasure? "2. Whether these Words ["but such as are bound by special Service"] doth not contradict that Vote wherein it was Resolved, That some Lords should not attend the King, though they were His Houshold Servants?" To desire a present Free Conference, touching the Order now brought. That the House of Commons (fn. 6) will give a present Meeting, as is desired. The Lord Privy (fn. 7) Seal was to speak at this Conference. House adjourned during Pleasure; and the House resumed. And, after the Conference, the Order was read again, without any Alteration. And likewise the Letter was read again; and it is Ordered, That this House hath agreed to (fn. 7) it. "To the Right Honourable the Lord Edward Howard, the Committee appointed by the Lords in Parliament residing at Yorke, These." but such as are bound thereto by special Service; and that whosoever, upon Pretence of His Majesty's Command, shall take Arms, and gather together with others in a Warlike Manner, to the Terror of the King's People, shall be esteemed Disturbers of the Public Peace, and to do that which may introduce a Precedent of very dangerous Consequence for the future, and produce most mischievous Effects for the present, considering the great Distempers of the Kingdom, and what pernicious Counsellors and Incendiaries are now about the King, and how desperate and ill-affected divers Persons attending upon His Majesty have shewed themselves to the Parliament, and to His other good Subjects, threatening and reproaching them publicly, even in His Majesty's Presence: And for preventing and avoiding such great Mischiefs as may thereupon ensue; it is Ordered and Ordained, by both Houses of Parliament, That, if the Trained Bands, or any other His Majesty's Subjects, shall, upon Pretence of any such Command, be drawn together, and put into a Posture of War, the Sheriff of that County where there shall be such raising or drawing together of armed Men do forthwith raise the Power of the County, to suppress the same, and to keep His Majesty's Peace, according to Law; and that the Lords Lieutenants, Deputy Lieutenants, Justices of the Peace, and all other His Majesty's Subjects, be aiding and assisting to the several and respective Sheriffs in Performance hereof, as they will answer the contrary at their Peril."